In the summer of 2008, I was sharing a cab in Las Vegas with one of our Sales VPs, as we both attended an industry tradeshow. At the time I was 26 years old, two years out of university, and eager to make an impact in my early career. 2008 was my fourth year at Sandvine, and I had recently switched from Product Management into Product Marketing, filling an emerging need as our marketing team grew to keep pace with the company in general. His answer, to a large extent, shaped the next few years of my career and would influence people’s understanding of the Internet. 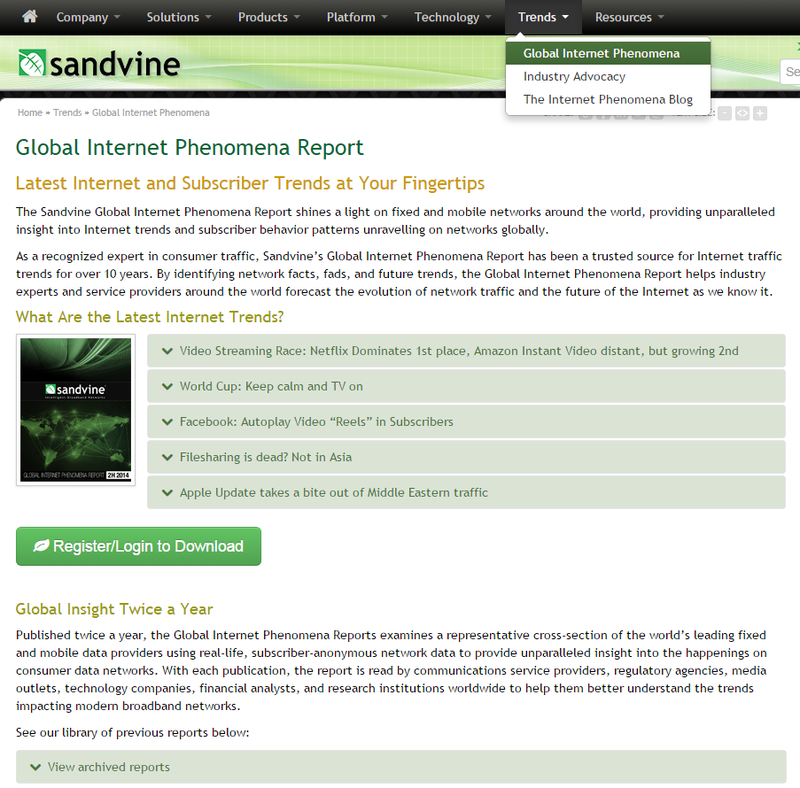 Since 2002, Sandvine had periodically released stats about Internet trends: the first such release, for instance, revealed to the world that peer-to-peer filesharing traffic accounted for 60% of Internet volume. At the time, prevailing wisdom was that Internet traffic consisted of web browsing, email, and FTP transfers, so this stat garnered some attention. Each year, the company released some new stats, shedding a bit more light on Internet trends, and getting increasingly global in the study’s coverage. The study became known as the Global Internet Phenomena report. In that cab, Angelo explained to me that all of his accounts were very interested in this study, and that he thought the study was the company’s single most important marketing activity. A new study virtually guaranteed that doors would open for meetings to discuss its findings, and it made prospects aware of our brand. In total, we probably only chatted about the subject for five minutes, but those five minutes stuck with me. For the rest of 2008, I wasn’t really in a position to act on the conversation – we had already released that year’s study, and in any case I didn’t even ‘own’ the study – but in 2009 I got my chance. The 2009 study was meant to be jointly prepared by me and a colleague, but I brought so many ideas and so much energy to the table that it became mine. In the lead-up, I’d reflected on my conversation with Angelo and I’d put some thought into how I could increase the impact and effectiveness of the study, and of the marketing program as a whole. My vision in 2009 was to create the world’s most comprehensive study of consumer Internet traffic trends. By doing so, we would become the go-to source for Internet traffic information for anyone: mainstream media, telecommunications publications, Internet providers, … anyone with an interest in such things. The commercial benefit to us would be increased brand awareness. But to get there, some things needed to change. The first limitation of the existing process, as I saw it, was that the study was basically created from scratch each year: the networks that participated in the study were different each time around, and there was no comprehensive data processing infrastructure in place. Combined, these problems meant that year-over-year conclusions were hard to come by, and I suspected our audience was very interested in changes over time rather than just one-off pieces of trivia. I also thought that we didn’t put enough effort into making the study truly global (as a growing, increasingly global company, we had a tremendous opportunity), and that we weren’t putting enough effort into making sure we had sufficiently large sample sizes. This latter point bothered me for two reasons. First, I wanted our findings to stand up to scrutiny and to be completely defensible, and I worried that insufficient coverage needlessly introduced risk. Second, since I wanted to create a study that built on itself year after year, the risk was compounded: we would have to live with any problem going forward. For instance, if we under-reported the amount of video streaming traffic one year and interpreted it as a decline, and the next year’s number rebounded due to better coverage (and a regression to the mean), then we’d have to try to explain some weird blip in the data. Much better to not have that blip in the first place. Finally, I thought the content itself was too salesy. I felt that the audience who was interested in these statistics would be put off by sales messages, and I felt strongly that to maximize our exposure we needed to cut down on the promotion and stick to presenting and analyzing the facts. Essentially, I’d mentally performed a gap analysis exercise and identified a number of things that needed to improve. My engineering degree provided me with a reasonable statistics background, so in 2009 I set about building a robust statistical processing infrastructure that would be the study’s platform for the foreseeable future. I also worked very closely with our global sales team, and in particular our sales engineers, to increase participation in the study. A handful of sales engineers were key, and without them the study would have foundered. I put more effort and hours into that study than had probably been consumed by all the previous years combined. Most of those hours were after-hours and on weekends, because the project itself usually didn’t take that long, so the rest of my workload hadn’t been adjusted…but I really didn’t mind; it was fun to work on, and I hadn’t really told anyone what I was doing with it, and I remained confident that I was building something special. In 2009 we released a decent study. Our media coverage was OK, but not spectacular, but I was certain that we were setting ourselves up for a bright future by creating a strong foundation for year-over-year comparison. The study had gone from a couple of pages in 2008 to something like 30 pages in 2009. The study was pretty awesome: we covered year-over-year changes that highlighted some very interesting developments, the analysis was good, our global coverage had improved, we made predictions (and people love predictions), etc. Netflix happened: some folks might not remember, but Netflix started out as a mail-order service. In 2009 they launched their on-demand streaming service, and in 2010 the popularity of that streaming service surged. We were there to observe and report. I listened to our audience: the 2010 study was embargoed to a handful of media outlets, and a couple of them contacted me asking for more information about Netflix. I’d included just a small “Did you know?” tidbit that said something like “Netflix is now 20.6% of North American Internet traffic.” In previous years, we’d been reporting about enormous amounts of P2P, so the Netflix number didn’t blow me away. Thankfully, I listed to these media outlets and provided them the extra information – it was the Netflix stat that blew the socks off the world. The day that study came out, we made the main page of CBC, BBC, CNN, Slashdot, and a couple of dozen other media outlets – telecom and mainstream alike. The stat got TV news coverage, and I was doing radio and print interviews for weeks afterwards, as were our executives. My mom called me up to ask if I was the same Lee Brooks who was on CBC Radio that morning (she hadn’t heard me, but one of her friends had mentioned it to her). In the ensuing days, we were covered by The Wall Street Journal, The New York Times, and, really, more publications than I can remember. In the ensuing days, we were covered by The Wall Street Journal, The New York Times, and, really, more publications than I can remember. We had hit the big time. Practically, doors opened up all over for us with potential customers who wanted to hear us present our findings and our analysis of what these Internet trends meant for their business. Shortly after our attention skyrocketed, I started to jointly write the report with a colleague, Dan Deeth. We made a good pair: Dan has media savvy and is ultra-passionate about technology, and I brought analytical skills and technical knowledge. Over the years, our company’s reputation has continued to grow, as we’ve tracked, interpreted, explained, and made predictions about the changing composition of the world’s Internet traffic. Each year our study gets picked up by major outlets worldwide, and we actually get asked ahead of time by media, and by customers and prospects, when the next study is coming out. We’re frequently asked to comment on or provide data for general Internet stories. In short, we’ve gained exposure that could not be bought. We’ve become the go-to company for Internet usage stats, and we’ve earned the trust that is placed in us by only presenting the facts and never trying to be sensational. Some of our competitors have tried to imitate us and failed when their stats and findings didn’t stand up to scrutiny (that’s what happens when you cherry-pick to garner headlines). At conferences around the world, if I ask “Have you heard of Sandvine?” and the person responds in the negative, I follow up with “Do you know that Netflix is a third of North American Internet traffic?” I’ve never had someone say no to that. I no longer write the studies (Dan does), but the stats aggregation platform remains essentially the same as when I wrote it back in 2009, and the program itself continues to evolve in line with the vision that I first plotted out after that cab ride. Who knows what would’ve happened if I hadn’t asked how to make an impact. Your go-to source for Internet facts, fads, and trends!